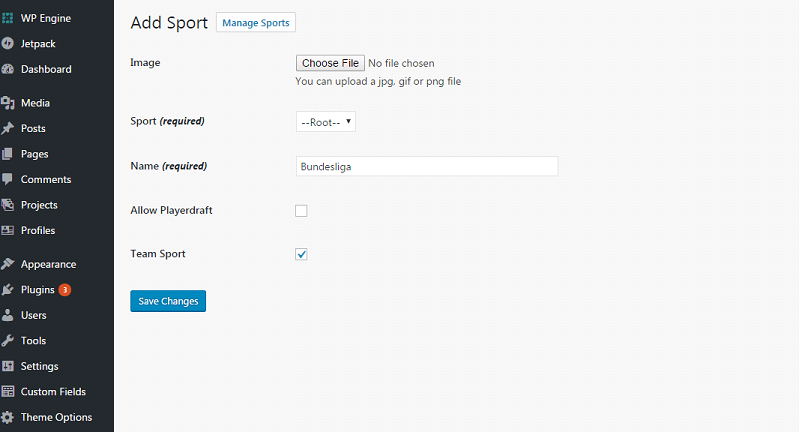 Fully customize which sports you want to support on your site. Choose one, some or all of them! We support All Major League Sports including College Sports. Here are just a few of the many sports this plugin supports: Football, Basketball, Baseball, Golf, Soccer (European and USA), Hockey, Nascar, Mixed Martial Arts and more!!! This Fantasy Sports plugin does it all! Select the site rake percentage. As a site owner, you can make money by defining a cost to purchase or withdraw credits AND/OR you can define what your rake is per pool. Standard rake is 10%. But we'll leave that up to you to decide. Its VERY flexible! Manage withdrawal requests with a simple table where withdrawal requests are listed. 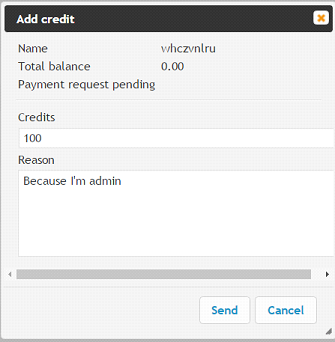 Site admins will be able to approve payments right from the admin control panel. How convenient is that?!?! Get up to the minute reports on deposits and withdrawals. You'll always know exactly how much money you're making. We'll even show you site statistics so you can keep track of how users are playing. You see everything! FanVictor.com was established in late 2014 with a mission to be the world’s premier provider of wholesale private label fantasy gaming and fantasy services. In line with this mission, Fan Victor – today – is the fastest growing provider of these private label services in the world. On this page, you will set up your sports and organization. A sport would be something like "Soccer" and an organization would be "Bundesliga". An organization belongs to a sport. First you must create your sport. So click on “Add new” at the top of this page and you would type “Soccer” and keep the drop down as “--Root--”. This will create the sport “Soccer”. 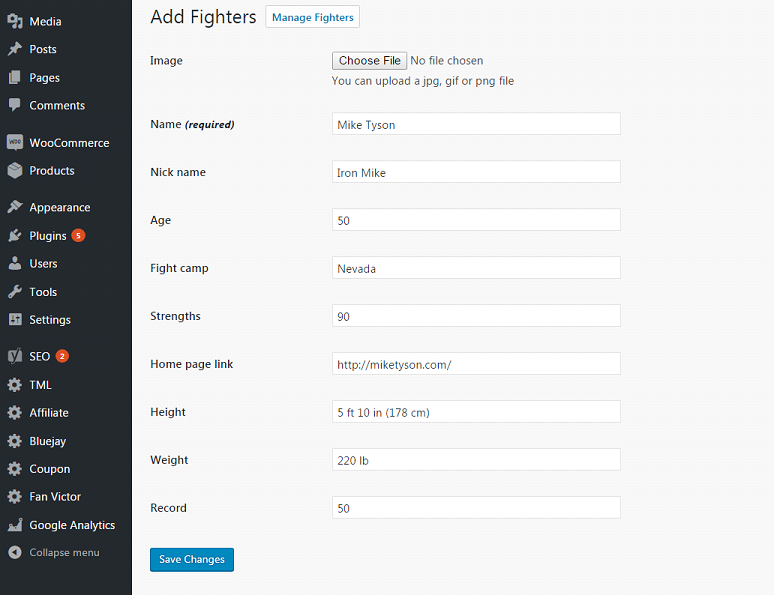 It will be an option added to the “Sport” dropdown on the whole website. Now you must create an organization that belongs to that sport. 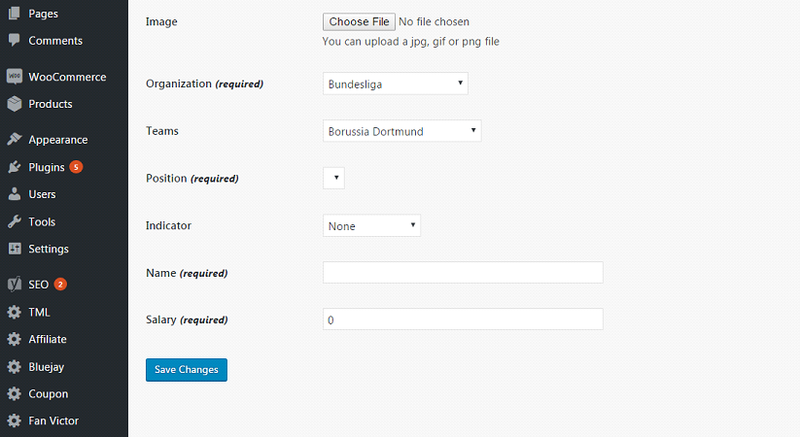 In this example, you would type “Bundesliga” and select “Soccer” from the drop down. Now, you have created an organization under a sport. Mark “Team Sport” checkbox if it’s a team sport (like Soccer, Football, Basketball, Rugby etc etc). Note: it should be applied not just for organization, but for sport too. On this page, you will set up events for all your organizations and sports. Event means a day, weekend, month, season or any other period of time when games are being played. 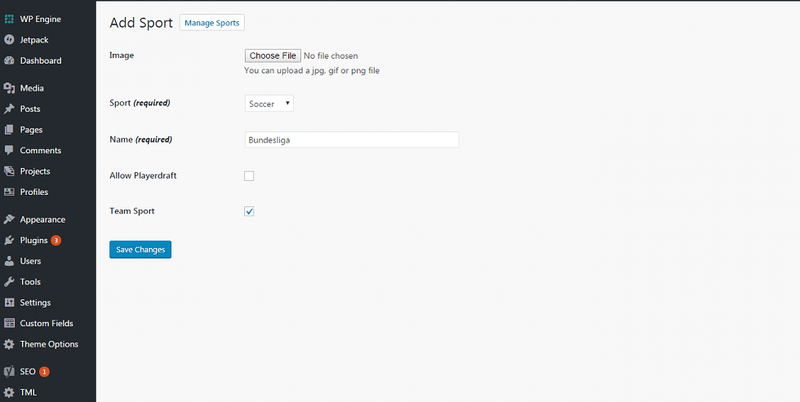 So in our example we created Soccer as a sport and Bundesliga as an organization. Now go to “Manage Events” page and click on “Add new” at the top of the page. Start date: it’s the start time of your event. Let’s say Week 10 games will start on April 21st at 8pm. Cut date: time when the event will be finished. I set it to April 23rd, 8pm. Live Event checkbox: mark it if it’s a real event that will happen in real live. 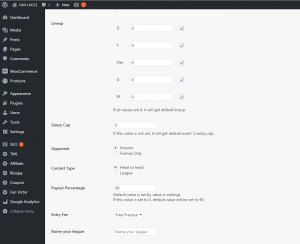 Salary Cap: salary cap means money that end users will have during their draft. Lineup: means the maximin players that user can draft to their team. It will used for all contests that will use this event. Fixture: in this field means you can set teams, that will play between each other during the event, fixture name and start time of the match. You can add as many matches as you want by clicking on + button next to the “Team 2” field. On this page you will see all available contest. You can invite your friends and users to join specific contest there. You can also see all the contest details here like contest creator, start time, contest status etc etc on this page. In order to add new contest click on “Add new” button at the top of the page. 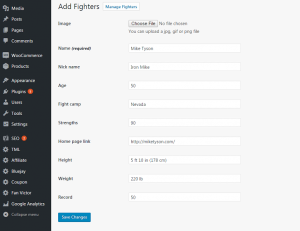 Clone Contest checkbox: once this contest room is full, our plugin will create the exact same new contest. Allow Edit when started: if you mark this checkbox, admin will be able to edit contest settings after the event is started. Refund on no fill: user will get money back if contest room was not full before the first game in the event kicks off. Sport type: there are two options - “Single sport” and “Mixing Sport”. If you select Mixing Sport it will allow you to mix all sports for the specific date. I.e. there are 3 events on the 21st of April for Soccer, Rugby and Basketball. 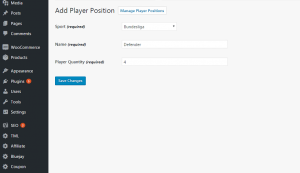 Using Mixing Sport option you will be able to draft players from all these sports. Pick your sport: you need to choose sport that will be connected with the contest here. Let’s choose Bundesliga. Player Restriction: Restriction on how many players can be picked from a single team. If this value is 0 or not set, there is no restriction for picking players. Events: you need to choose event here that we created in section 3. Fixture Selection: you need to choose fixture here that we created in section 3. Lineup: default linepup for this contest. Opponent: there are two options - “Anyone” means any logged in user can join the contest and “Friends only” only invited users will see and will be able to join this contest. Multi Entry checkbox: means user can join this contest multiple times. League size: this field define how many users can join the contest. Prize Structure: there are three options - “Winner takes all” means the user who will get the most points in contest will win. “Top Three get prizes” means top three users will divide the “bank”. You can setup Top 3's percentages in these fields. “Multi Payout”. In this case you can define what places will get money and how much. Payout Percentage: in this field you define the payout percentage that will go to user. I.e. Entry fee is $1, league size is 10 users and payout percentage is set to 90%. So it will be $10 in the “bank” once contest room is full and once the contest is finished end users will get $9 and admin will get $1. Entry Fee: in this field you define how much money user should pay to enter the contest. You may also create the contest without entry fee. Name your league: it’s the name of the contest. 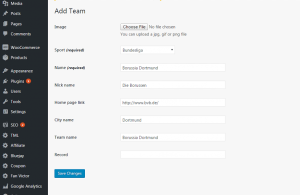 On this page admin can create, delete and manage teams for all sports and organizations. Sport: choose organization you want to add positions for. Name: position name. Since our example is Soccer, then we’ll create new position called “Defender”. For this sport we would also need “Goalkeeper”, “Midfielder” and “Forward”. 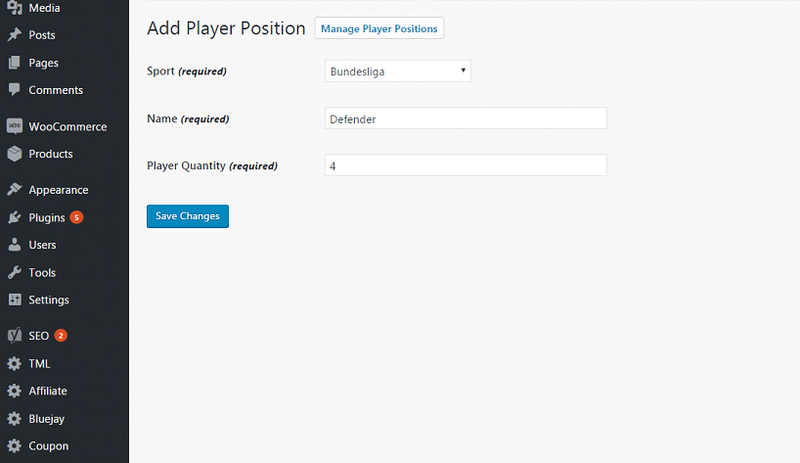 Player Quantity: define how many players user can assign to this position. Organization: choose organization you want to create scoring category for. Name: scoring category name. I.e. Goal, assist, yellow card etc. Point: number of points that will be awarded to a player in case he fulfilled the conditions of created scoring category. Organization: select organization you’re creating player for. Team: elect team you’re creating player for. Position: select player position that you created in step 7. Salary: player salary. This parameter is closely connected with salary cap. On this page you can manage add, change, remove news for each player. Player news will be available on popup when somebody clicks on player’s name on draft page. Basically, these page is need only for couple things, but it’s very important from website admin perspective. 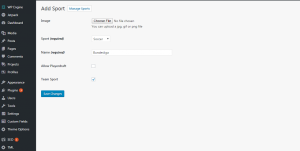 Firstly, on this page you can review account balance of each user on the website. 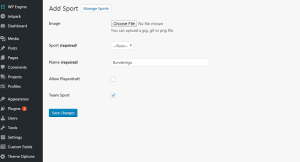 Secondly, you can manage user balance on this page. You can add and remove credits from the account. Thirdly, you can see payment status here. On this page website admin can manually approve and decline user’s withdrawal requests. You can see how much money user requested to withdraw, payment gateway he wants to use, his username and date when he requested withdrawal. On this page you can see all the details for all contests and events on your website. It displays contest name, game type, event name, start contest date, what user created this contest and contest status.